The best female basketball player no one’s ever heard of hails from Moravia, Iowa. Well, alright, some people have heard of her. But for some strange reason, she is not among the 125 people in the Women’s Basketball Hall of Fame. This forgotten phenom is Molly Bolin — the first woman to sign with the fledgling Women’s Basketball League in 1977 and the league’s undisputed scoring leader in its three years of operation. Bolin helped to keep a couple of failing women’s professional leagues afloat in the late 1970s and early 1980s — until they finally sank under the weight of some questionable — and downright smarmy — business practices. (Not to mention sporadic media coverage devoid of any actual insight into the women’s level of play). The big names in women’s basketball back in 1977, when a man named Bill Byrnes decided to start the WBL, were Lusia Harris, Ann Myers, Nancy Lieberman, and Carol Blazejowski. All four starred in college in the mid to late 1970s. Harris had helped Delta State win its third straight AIAW championship in 1977, defeating Louisiana State University in front of 4,500 fans at the University of Minnesota in Minneapolis. The New Orleans Jazz of the National Basketball Association drafted Harris in the seventh round of their annual draft — the second woman ever to be drafted by a men’s pro league. (The first was Denise Long, who scored more than 6,000 points in her storybook high school career in Union, Iowa in 1969). Myers, Lieberman, and Blazejowski were playing for UCLA, Old Dominion, and Montclair State, respectively, in 1977. Blazejowski had become a scoring whiz at Montclair State, finishing her career with the highest points per game average of any college player (31.7) and a single-game record for most points scored at Madison Square Garden (52). Myers, the first woman to earn a full scholarship to play college ball, was also a scoring machine at UCLA, and, even before graduating, she and Harris anchored the U.S. teams that played in the Pan Am games and the World Championships during the 1970s. Lieberman was still at Old Dominion University in 1977, garnering attention for women’s basketball with her no-look passes and outgoing personality. With these stars in the wings — and the 1980 Olympics on the horizon — Byrnes thought the time had come for a pro league for women. The big names would garner lots of media attention — and the Olympics in Moscow would seal the deal. But the U.S. boycotted those Olympics — and Harris decided not to play for the WBL. Myers, meanwhile was drafted by the NBA’s Indiana Pacers and decided to try out with them, rather than the WBL. That left the new league with lots of second-tier players to try and generate enough income to make the eight franchises — in Iowa, New Jersey, Milwaukee, Chicago, Minnesota, Ohio, New York, and Houston — a viable entity. Enter Molly Bolin. She had been an amazing, long-range jump shooter in the Iowa six-on-six high school game, scoring 80 points in one game and 70 in another. Bolin needed little room — and seemingly no time — for her turn-around jumper. She was as “automatic” as anyone in the women’s game, and reminded many of Larry Bird, another Midwestern basketball legend. As this grainy YouTube video from a game in 1983 during another short-lived professional women’s league season (WABA) shows, Bolin was an impressive offensive player. She wasn’t known as much of a defensive player, (since she never had to play defense in high school). But in this video she’s going head to head with Nancy Lieberman, and seeming to hold her own as Bolin’s team (Iowa), hands Dallas its first loss of the season. With her long, blonde hair, blue eyes, and slender figure, Bolin also was a favorite with the male sportswriters who gave the new league dubious coverage in those early days. The media dubbed her “Machine Gun Molly,” and from the WBL’s first year in 1978 to its dying days in 1980, Bolin was there every night, lighting up the scoreboard and flashing a smile. She scored 16 points a game in her rookie season, despite having no experience in the five-player game. By her second year in the league, she’d hit her stride. She led the league in scoring with a 33 points per game average, scoring a record 38 points in a single half several times (despite the box-and-one zone defenses many teams employed against her — and the lack of a women’s three-point line). Bolin’s Iowa Cornets were runners-up for the league championship in each of the WBL’s first two years. Though the Cornets folded in the third year of the WBL, she was scooped up by the San Francisco Pioneers, where she continued to light it up for an average of 33 points a night. Bolin also shouldered the promotional load for the league, posing for posters in a tank top and tight-fitting shorts. Feminists and basketball purists (including me) harrumphed at the Farah Fawcett approach to marketing, but league officials were trying to counter the homophobia that still pervaded attitudes about women in sports — and Bolin was philosophical about it. 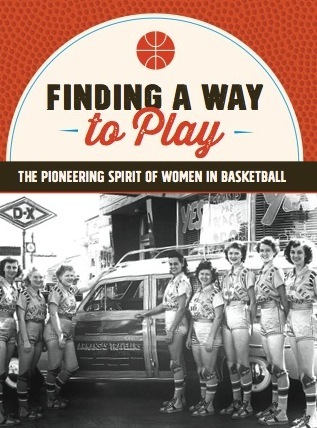 Bolin saw women’s professional basketball through its dying days as a marginal entity. She suffered the indignities that all those early pro players did: bounced checks, one meal a day, apartments with no heat, unwanted advances from male “admirers,” who in some cases were on the coaching staff. 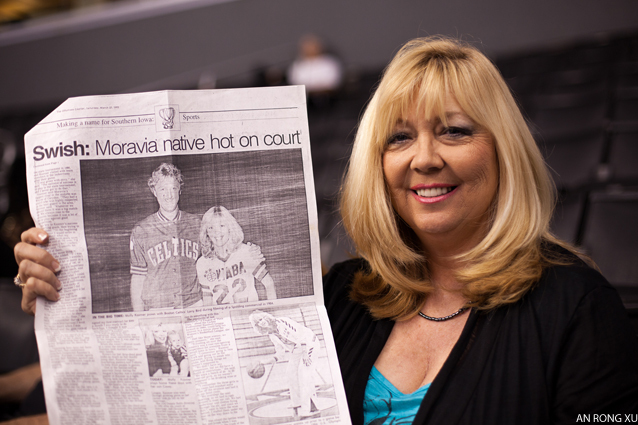 After the WABA folded, Bolin was unable to take advantage of opportunities to play overseas because she was a single mom, raising a young son. She also couldn’t compete for a spot on the 1984 U.S. Olympic team because she was no longer an amateur. However, she was recruited –along with many other former pros — to play on an all-star team that competed against the U.S. Olympic team in preparation for the 1984 Games. This team was coached by Hall of Famer Sue Gunter. Other players on the team included Nancy Lieberman, Carol Blazejowski, and Holly Warlick, who are all Women’s Basketball Hall of Famers. That was pretty much the end of Machine Gun Molly’s playing career. She tirelessly advocated for a pro league in the early 1990s as a quasi commissioner, and she still runs basketball shot camps for kids with her husband, John Kazmer. But, as women’s basketball gained traction in the 90s — thanks to Tennessee, UConn, and the U.S. Olympic teams — Bolin’s legacy faded into the shadows. Her 50+ point games aren’t recognized as women’s pro basketball records by the WNBA. And while her Iowa Cornets uniform is hanging in the Naismith Hall of Fame as part of a WBL display, the Women’s Basketball Hall of Fame is still shunning her. It’s time to rectify that situation. ← Could this be the year for McCallie and Duke?